I’m adding a store to Homegrown Lutherie (HGL)/Newman Guitars! 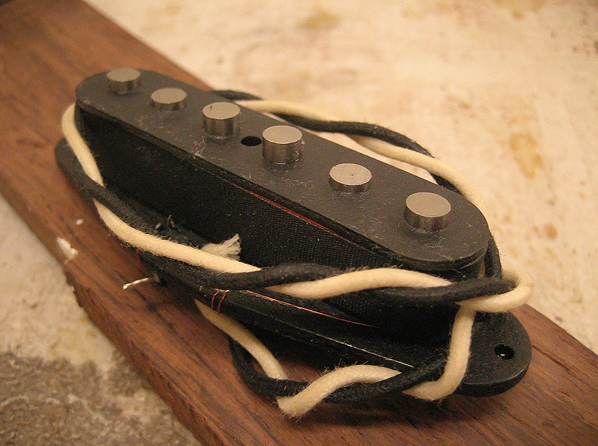 Currently there are some Handwound Single Coil (strat) pickups available. You can visit the store by clicking here. Just thought I would let all who visit here know….the blueprints page currently has one Les Paul print 1:1 scale plane, one Torres 1:1 scale print, and 1:1 scale plans for a rosette cutting tool. Coming soon the page will be getting an update with a new set of blueprints for….the Rickenbacker 325. Have been working every day 12 hours for a week or two…exhaustion is long past set in, but regardless I’ve managed to find a couple of hours to work on this project and it’s coming along quite nicely. First step – make some cheese bread from scratch! After that I hogged out material for the pickup routes and the wire channel, then screwed down my acrylic template. Routed out the cavities. Had some tearout from rushing and not being careful (exhaustion) but it will be hidden in the end under the pickguard anyways. I will patch it up and clean it up a bit later. This is what I’m going for – same as my first build (the prototype). All gold hardware, two humbuckers – one volume, one tone, and a blend pot instead of a toggle switch. Gotoh TOM bridge and stop tailpiece. The headstock inlay has been order from DePaule supply, so I’m looking forward to having that here so I can finish up the neck. I started building a new instrument today – I’m building another J-11. I received some really nice mahogany and rosewood today so I figured this is what I’ll be building. I’ve got enough mahogany to build two guitar bodies and four necks – so I’ll make two mahogany builds, one after the other. I’ve also got this guitar body that I plan to finally finish. It’s been sitting here for a while, but I didn’t want to give it a khaya neck because it’s too dark. I’ve got lots of really dark Khaya here but nothing that matched in color to this body, which is Spanish Cedar. Cut out the first guitar body pieces and glued them up into a single blank. Cut out the body shape on the bandsaw after gluing, then planed the whole thing. Looking good so far! Next I pulled out that trusty little handplane. Cut the neck plane. The neck plane on this guitar will be two degrees, good for a TOM bridge. I’m thinking gold hardware for this one. This guitar will have the neck angle done like a modern LP Jr – the angle planed, then blended in so it’s subtle and not that noticeable. You can see the angle here. Carved the neck plane on the ziricote guitar using the same method. Then smoothed it out with the belt sander. The curvature would be hardly noticeable if not for the dark colored cap which gives it away. Managed to get it quite subtle so it shant be an issue. I had wanted to give a go at designing my own guitar for a while, and finally got the gumption to go ahead with it. It has a strat-inspired body, but the neck is angled like a Gibson guitar (since it uses a Tremolo it will also have an angled headstock – Fender guitars have a flat headstock, which doesn’t make sense because that makes them require string tees which impair tremolo function! Not well thought out in my opinion – but then, they are made to be slapped together with bolts easily). 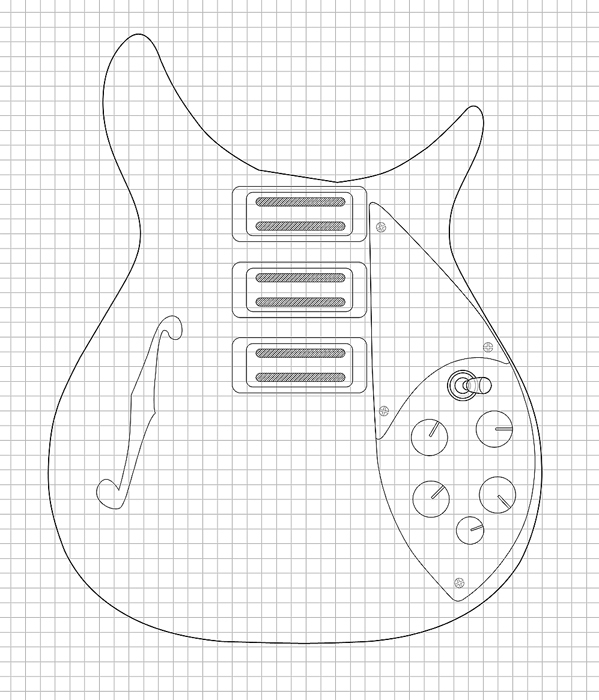 Started with blueprints – it has evolved since then so it has single coils and a pickguard rather than humbuckers; this is an early speculative drawing. The prototype will have a TOM instead of a tremolo. The name also change from Lucas. A (My middle names) to Newman. From that drawing I created this 3D concept which I posted a little while ago. Designed in 3Ds max. I also designed a set of templates which were laser cut in clear acrylic. Then I went a little bit crazy in an exotic woods store and bought over $300 in Spanish Cedar, Ziricote, and Striped Ebony (enough for three guitars). Cut the wood which has horizontal grain so that I had some quartersawn neck blanks. The neck blanks, plus an African Mahogany neck I made with a Gibson headstock – not sure what to do with that one yet. Then I joined the top to make one board to be glued to the body (this is for #2, the Ziricote build – not the prototype build). And the completed body in Spanish Cedar – I had sketched up the front with pickup placement, control cavity placement, tenon placement, etc. but this face side was then covered up with the Ziricote top I joined earlier (this was not the prototype body either). And that is it for the moment…more shortly. So here is the (almost) unveiling of my secret project…..I have been working on a set of open source (yay! free stuff!) blueprints for the lutherie community. Hopefully this set will be even more detailed and extensive than the Les Paul blueprints (see the resources section from the menu at the top for those). I getting close to completing a set of prints for….dun dun dun! An 1882 Antonio de Torres classical guitar. The plans are being made from photo resources that have been sourced from the Médiathèque de la Cité de la musique (Paris) website, as well as measurements that were actually taken from the instrument which I’ve been able to source from the internet (mostly excerpts form google books). Measurements taken from other Torres guitars from years prior to 1882 are being used as a source for the bracing pattern and neck joint (so while the model is after the 1882, it will actually be a melange of the 1882 guitar body, neck, bridge, and scale length, plus measurements from some other Torres guitars for the bracing etc. which I was unable to find for the 1882 guitar). I will make these available as soon as they are finished – but until then, here is a preview of the drawing in it’s current state. Mock up of the 1882 Torres guitar blueprints in progress; I anticipate completion of this drawing within two to three weeks.